About 600 people took part in the annual seminar presented by Ezer Mizion’s Family Counseling Center entitled “A Bridge of Hope.” The seminar discussed the importance of hope both for the patient and his family. The audience included prominent educators, among them Roshei Yeshiva, mashgichim, and professionals, as well as parents and other relatives of the mentally ill. Senior members of the Health Ministry staff praised the initiative and its value to the chareidi community. The seminar was chaired by Rabbi Zev Schechter. Rabbi Chananya Chollak, International Chairman of Ezer Mizion, greeted the attendees warmly. Top lecturers in the mental health field presented their treatment approach and the latest innovations to the eager listeners. Among the speakers were Professor Yisrael Strauss, Deputy Director of the Department of Mental Health Centers in Beer Yaakov and Nes Tziona and Professor David Ro’eh, of the Mental Health Department in Haifa University. Mr. Tzviel Rofeh, a group leader and author, who himself overcame mental illness, kept the audience spellbound with his personal story. Dr. Uzi Shai, Tel Aviv Regional Psychiatrist, led a fascinating panel discussion, with the participation of Rabbi Chananya Chollak, Professor David Ro’eh, Professor Yisrael Strauss, Mr. Tzviel Rofeh, Rabbi Shlomo Stern, Rabbi Yehuda Silver, and Mr. Elad Milo, Director of Occupational Rehabilitation at Ezer Mizion. As is well known, mental problems affect not only the patient himself but also his family members. At the same time, the family’s conduct and its ability to deal with the difficult situation have a strong impact on the patient’s progress on the road to recovery. Many of the families who encounter these challenges have no idea where to turn for help. As a result, the patient often receives treatment only after a significant delay, which can negatively affect his chances of a complete recovery. 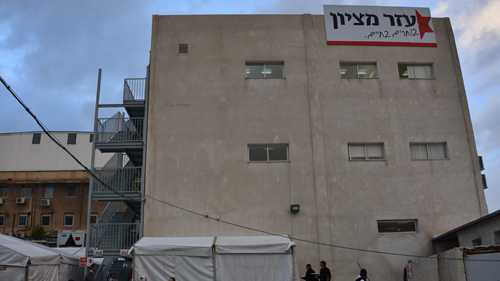 The Family Support Center, a project of Ezer Mizion’s Mental Health Division, was established specifically in order to respond to these important needs. The Center’s staff helps the family determine if their concerns indeed indicate a real problem requiring treatment or if what they see is merely a fleeting phenomenon that will dissipate on its own. Families can also receive information about the particular disorder and its ramifications, referral to available services and therapy options, assistance in actualizing entitlements, tools to help them cope, and emotional support for the family members.